The world largest economy shut down its most prestigious space center agency. 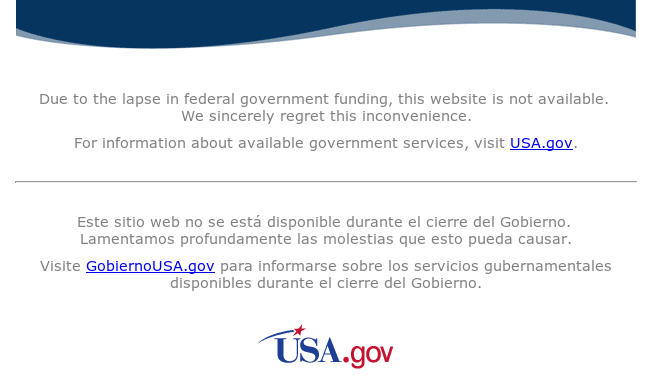 Wikipedia provides some background information here: government shutdown. Regarding NASA it says: NASA will furlough 98% of its staff, leaving fewer than 600 out of more than 18,000 employees on the job. NASA will continue to support the astronauts on the International Space Station and the agency will maintain spacecraft that have already launched. However, work with unmanned spacecraft will be minimal. The Hubble Space Telescope, Curiosity and Opportunity Mars rovers will continue to operate, but analysis of the data it collects will cease. Added 18-Oct-2013: NASA is online again. There are 14 major carriers listed for India, including two state owned providers. None have over 180 million subscribers. The smartphone market in India is expanding at about 160% annually, compared to overall world growth of about 40%. India is growing over four times as fast as everyone else, even outpacing China (86% growth year over year), and lapping the US handily (19%). Android is used on about 90% of hardware made for India last quarter. This means that almost 30-times more people in India have a mobile phone than a landline phone. The year 2011 numbers for Germany are 51.8 million vs. 108.7 million, i.e., 1:2. The numbers for USA for the same year are 146 million vs. 290.3 million. According Los Angeles Times China built 600 dams per year on average. This trend will continue. According Wikipedia, or Jie Cai’s Master Thesis, China has the largest potential for hydropower in the world and currently ranks first in hydroelectric generating capacity with about 200,000 MW online. Below picture is from Edward Burtynsky.